Shakespeare: Don’t Be Afraid – The Bookshelf of Emily J. We always laugh when my husband notices a mistake in a text before I do. But he noticed an inconsistency with the BBC book list when I didn’t. The Complete Works of Shakespeare is listed as number 14, and Hamlet (obviously one of Shakespeare’s “complete works”) is listed as number 98. As an editor, I should have noticed this error, but he did and I didn’t. As to my reading of the The Complete Works of Shakespeare, I count having seen plays because Shakespeare’s canon is best seen performed. However, I have read my fair share as well. During my senior year of college, I took a Shakespeare seminar. I still remember entering the classroom for the first time, my hands shaking and my brain whirring. Either Shakespeare or Milton was required to graduate. I chose Shakespeare (although I have since read Milton), but they both terrified me. Would I be able to pass this class? Would I enjoy any of it? My earliest experience with Shakespeare was reading Cymbeline with my mom and sisters. My mom thought it would be fun to have us each take on certain roles and read the play out loud together. This was boring. As a fourteen-year-old, I did not understand most of what we read. In high school, I attended a performance of As You Like It because a few of my friends were playing main roles. I remember enjoying it a little more than I had Cymbeline, but I did not quite understand everything. While the audience roared with laughter, I looked about myself bewildered and then pretended to laugh, too. I didn’t want anybody to know that I hadn’t understood dear William’s jokes. My ignorance and fear of Shakespeare all disappeared with that senior seminar in college. Professor Duerden taught with skill and ease. He directed lively discussions and opened my mind to the beauty of Shakespeare. I attribute this to his excellent teaching skills, but also to his class requirements for the reading. For each play, we were required to read it twice. After this reading had been accomplished, we were then required to watch a performance of it, whether in person or on tape. I obviously spent many long, quiet hours reading the plays, but watching them performed proved truly fantastic. I would find tapes of the plays at the city library or campus library, depending on where the films were available. Then, because my husband and I were newlyweds, we would watch them together on a Friday night, cuddling, snacking, and laughing at the characters’ antics. To this day, my husband loves Shakespeare almost as much as I do because of that time spent watching the plays. I had a conversation about boring Shakespeare with a neighbor a few weeks ago. This neighbor perused my bookshelf and commented on my collection, noting that he would never like or understand or even try Shakespeare. As I began to try to convert him to my love of Shakespeare, my husband joined in, telling him that the plays must be watched and that they are great fun. I don’t think we convinced him. As to A Midsummer Night’s Dream, I first saw this with my favorite college roommate Jenn. I will always consider her to be one of my best friends, although life and circumstances have kept us apart for the last decade. She is seven years older than me, but I think that’s why I feel so close to her. She is the big sister I never had. I could go on about Jenn and what a special person she is, but back to the story. One evening, we decided to attend the movie, starring Kevin Kline, Michelle Pfeiffer, Rupert Everett, and Calista Flockhart. But first, we loaded a gigantic bag Jenn had brought with Wendy’s baked potatoes, chili, fries, chicken sandwiches, salads, and drinks. After sneaking the food into the theater, we sat in the back, munching heartily and noisily on our aromatic and delicious dinners. I’ll never forget that time spent with her, and it all happened because of Shakespeare. So, if you haven’t given Shakespeare a try, start with the movies or a local play. Maybe stick to the comedies and tragedies. (The histories are a bit dry, but Kenneth Branagh, known for directing and starring in many Shakespeare movies, has a nice version of Henry V.) You’ll find humor, the secrets of life, and pure enjoyment. 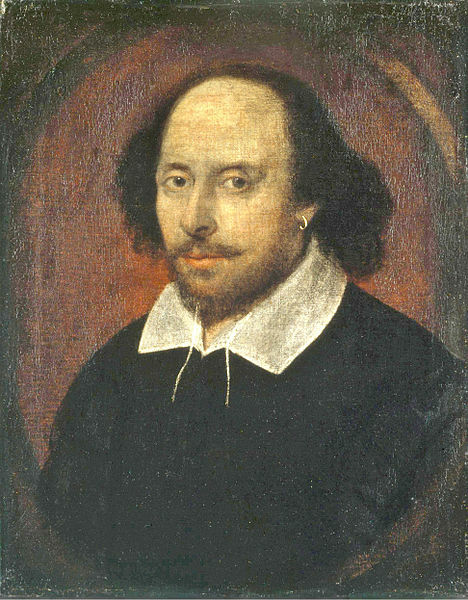 Shakespeare is an acquired taste, one more easily developed in adulthood. You’ll like him. I promise. Great post. Shakespeare is wonderful, and most folks don’t realize how much modern entertainment has borrowed from the Bard. A recent favorite with Shakespearean roots is The Story of Edgar Sawtelle, which plays beautifully upon the themes in Hamlet (my favorite of Shakespeare’s plays). Speaking of the BBC list’s mistakes, a few years ago they listed both The Chronicles of Narnia and, later in the list, The Lion, The Witch & The Wardrobe. Silly BBC – you’d think they’d be more aware when it comes to British Literature. Good point. I’m beginning to wonder if this list is really a BBC list or just some folkloric joke that made its rounds. And there are some I will NEVER see or read again. Titus Andronicus comes to mind there. My dad took me to Laurence Olivier’s Hamlet when I was 13 (entirely too Long). But I will always love Shakespeare and each year I make sure to reread the plays before we go down.And I read commentary on them as well. Like the scriptures I find things I KNOW weren’t in the plays with previous viewings or readings. Sorry I lost my other post since I was really getting wound up. I intend to respond to your Carol Lynn Pearson post She was in As You Like one summer at Shakespeare, But my response will concern a very good h.s. and college friend whom I guess you could say I sort of dated and who was gay. I can’t believe I forgot about the Shakespearean festival! I’ve never even been, but it is definitely on my bucket list. When my kids are older, we are taking them. I like your comparison of Shakespeare to the scriptures. So true! I look forward to reading your comments on Carol Lynn Pearson and Me. Shakespeare has and will continue to stand the test of time, because it is enjoyed on so many levels by almost every age. My daughters both enjoy it–they voluntarily put on “Twelfth Night” to watch. They also love “Much Ado About Nothing” (my favorite), and probably every one of the comedies they’ve seen. My side of the family attends the Cedar City Shakespeare Festival every summer. To see it performed is to love it–tragedy, comedy, or history. I can’t believe your kids watch it. That’s great! I never even thought to expose my kids to Shakespeare so young, but perhaps I might because of your fabulous example. I haven’t read that post, but I will now! I struggled a bit with “Romeo and Juliet” as a sophomore in high school, but I got the hang of it by the time I did “Hamlet” as a Senior. “Much Ado About Nothing” is my all time favorite — love Keneth Branagh’s version. That’s a wonderful version. This makes me want to see it again! Another great read, Em. I performed in a ballet version of A Midsummer Night’s Dream when I was a child. I have great memories of my mother explaining the story to me, and helping me understand who Puck and Bottom were. (And why Bottom looked like a donkey!) I fell in love with the story. I finally read it when I was a teen and then began reading Shakespeare in earnest. I agree with Neesha; ‘Much Ado About Nothing’ is my favorite as well. Great Post. Thanks for helping reminisce a little… and be inspired to pick it back up.. When you say you put music to a Hamlet soliloquy, did you write the music? I’d love to hear it! We should all go to the Shakespearean Festival! I too took a college course on the Bard, but it was a “Shakespeare in Film” seminar. What a fantastic way to experience the plays, and we were expected to write our papers comparing and contrasting the way a stage play vs. a film could tell the original story. I wrote on Branaugh’s Henry V adaptation and how the battle scene was enriched by the medium of cinema. That’s a spectacular idea. As soon as my kids are old enough, let’s go! We need to watch the them again. Good idea! I will put them in the Netflix queue. Pingback: The Mess of Brave New World « The Bookshelf of Emily J.
I really do fear Shakespeare. Apart from that, I have only read some excerpts from Julius Caesar.. as for Shakespeare is concerned. Which play would you recommend that I can easily read? I really like The Winter’s Tale. I would suggest watching them as well. That counts, right? And sometimes they are more enjoyable with the actor’s expressions. 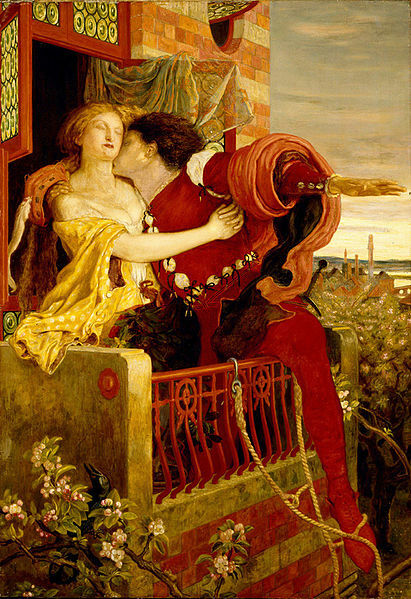 Romeo and Juliet is always a classic as well. I’ve only read Romeo and Juliet and Macbeth, both during high school, and I have to agree they must be watched, or at the very least, read aloud! I think in a class environment, getting parts to play, and having to read it aloud, works quite well, as long as people put some effort in and use some expression to make it interesting. Plus an edition with notes on the side to ‘translate’ the work into modern English doesn’t hurt either. I probably will read some more Shakespeare later in life, when I can be bothered, I think you just need to be in the mood, and spend the time figuring out what he’s saying. It most certainly is an acquired taste! Are there particular works that you recommend? I recommend The Winter’s Tale or As You Like It. And I like your suggestion to read it aloud with parts for different people. My mom and my sisters used to do that together. It did make it more exciting and understandable. I love Shakespeare. My favourite play is The Tempest. He seems to have mellowed out a bit with this play, it’s a lot easier to read. I would direct anyone wishing to get into Shakespeare to this play. His romance plays all seem a bit mellowed with age though I haven’t read Cymbaline yet. The Tempest is an awesome place to tell people to start. Great suggestion! Pingback: Underlining Random Terms In a Dense Book | The Bookshelf of Emily J.